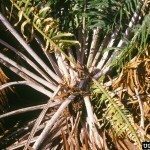 My Sago palms have gone several days of cold weather below freezing temperatures. All the limbs are completely yellow. Should I cut them back to the center of the plant and should they be cut back now? This is a hard question... They don't handle freezes very well... You should wait until you see new growth before you cut off anything dead.